- package - 75 Gm. We are engaged in dealing with a product called Permethrin Soaps. We are well-known firm of Permethrin Animal Insecticidal Soap. In addition, quality experts also check the quality of this product on varied industry standards. Besides, we offer this product at nominal costs. 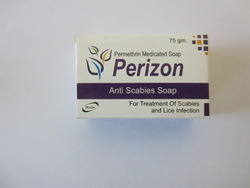 Permethrin Soap is used for giving a hygienic bath to scabies and lice infested patients. 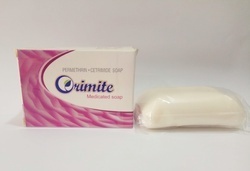 - Packing : 75 g.
We have made our presence felt in the market by offering the best quality of Permethrin soap with Brand as Beryscab Soap. These soaps are also known as Anti- Scrabies Soap as these soaps are used for the treatment of scabies. Composition: Permethrin 5.0%w/w, Soap Noodles q.s.